This tutorial is continued from page 2. Return to the start of the tutorial. 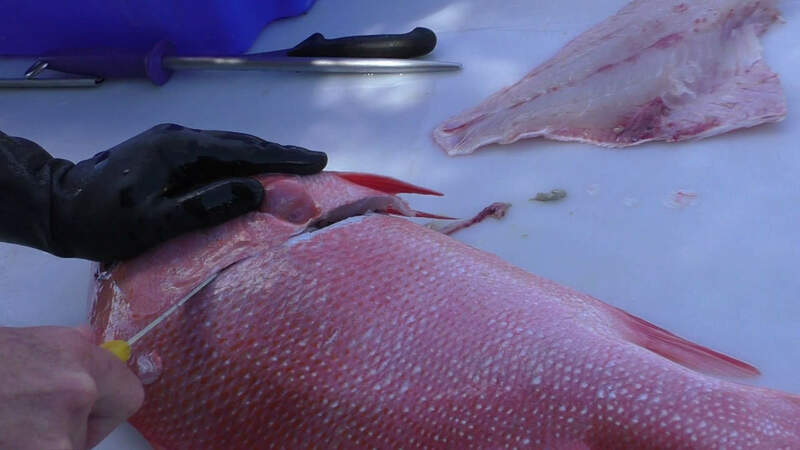 For the second fillet turn the fish around so the head faces to your left now with the belly facing away from you. Use your left hand to hold the pectoral fin out of the way. 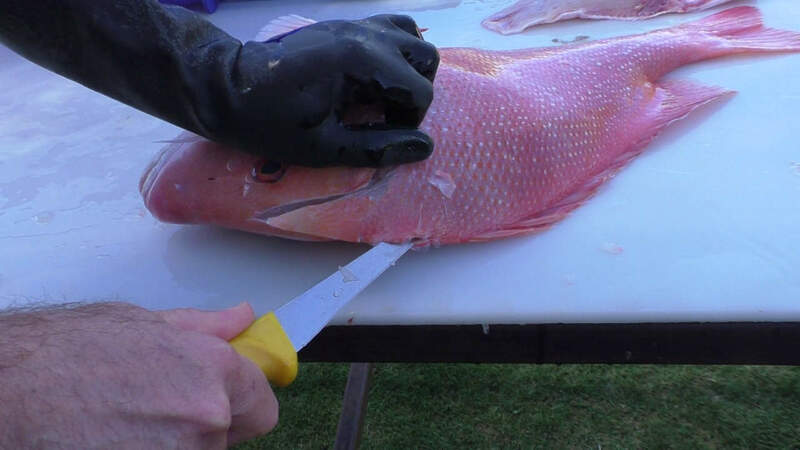 Poke the knife in just below the pectoral fin and stab it into the fish. 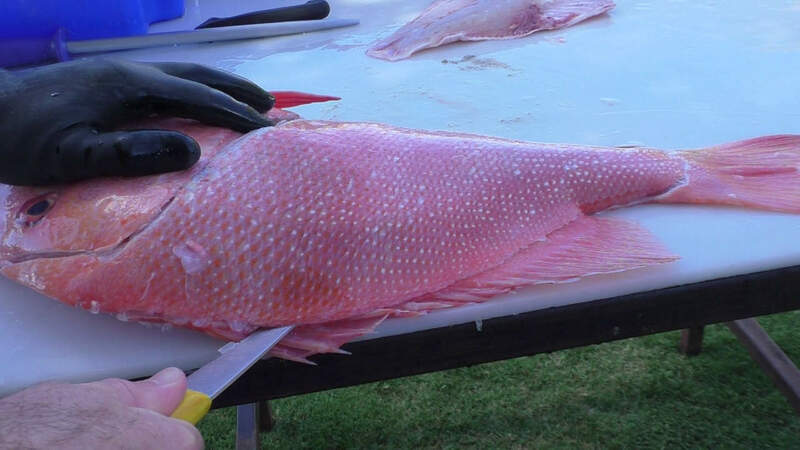 Cut down towards the belly and finish the cut just behind the pelvic fin. 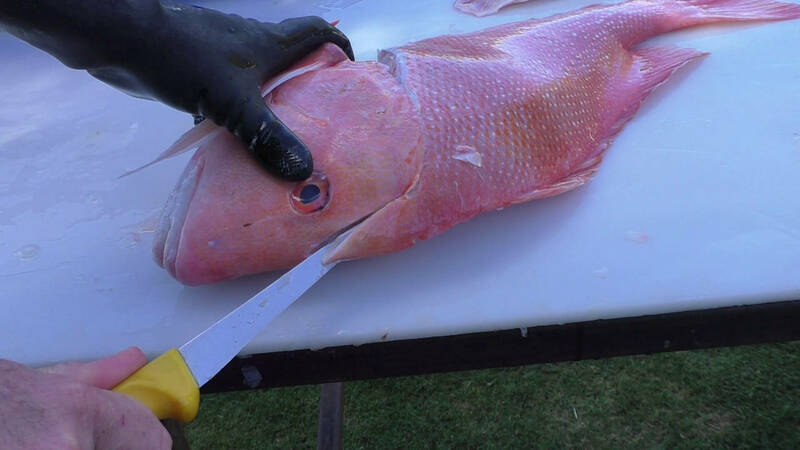 Now reposition your knife ready to cut up into the head meat just as you did on the first side of the fish. 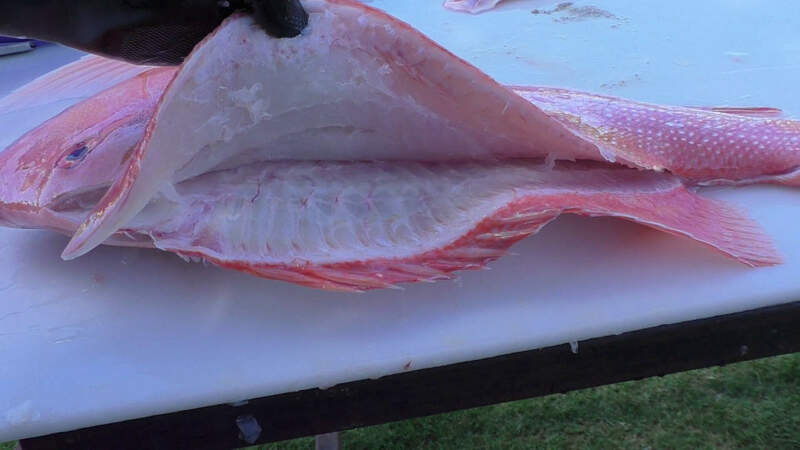 Cut up around the head behind the gill plate, take note of the angle of the knife in the picture below. 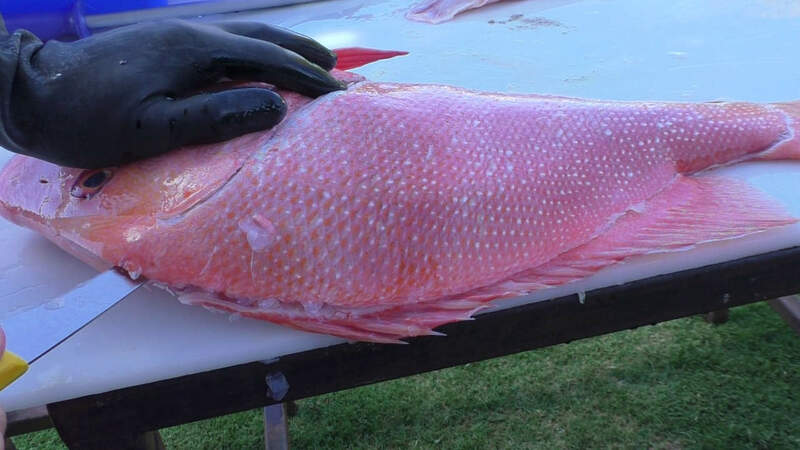 Once again you want to cut right up into the head when you reach about the eye level of the fish. Press down firmly to cut through the tough skin and keep your left hand well out of the way. Twist the knife around ready to cut down towards the tail of the fish. 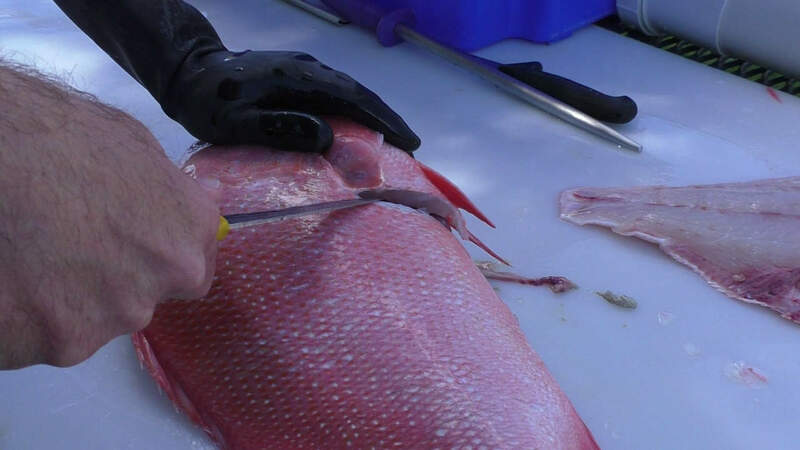 Now you need to slide the knife down the dorsal spines just like you did on the first fillet. Unfortunately this is a bit more difficult on the second side since the frame of the fish is no longer supported. Again, practice is the key. 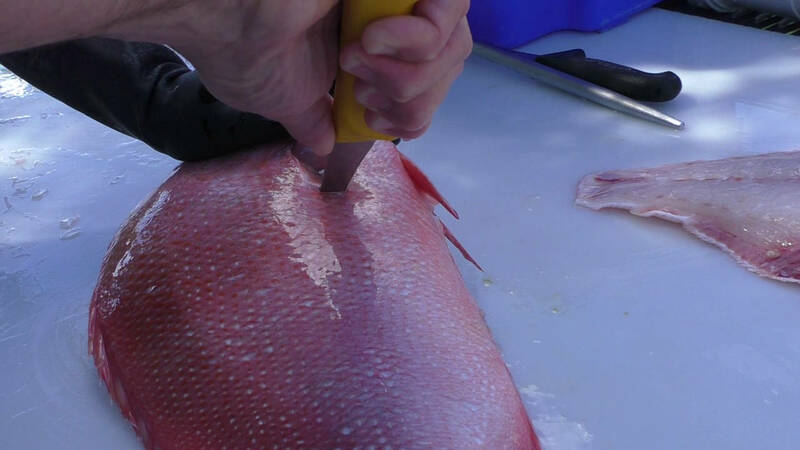 Continue sliding down the dorsal spines, press down firmly and just use the tip of the knife with a very slight angle as shown in the image below. Continue down towards the tail of the fish. Once you reach the tail push the knife through and out the other side. 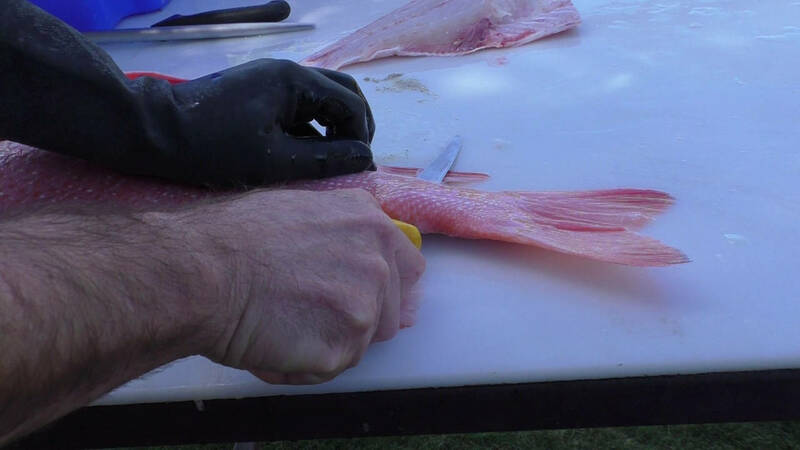 With one final swipe cut out and clear the tail of the fillet away from the fish. 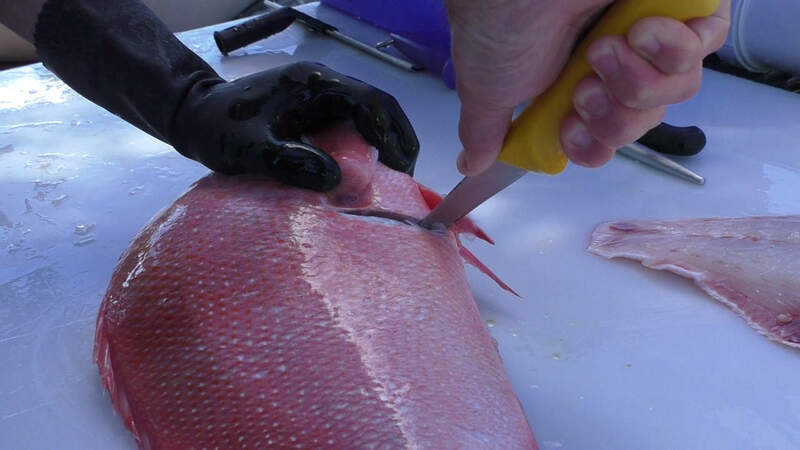 The initial cut along the dorsal spines only clears away a few cm of the flesh so now you need to swipe the knife along the full length of the fish clearing the flesh away right down to the spine. 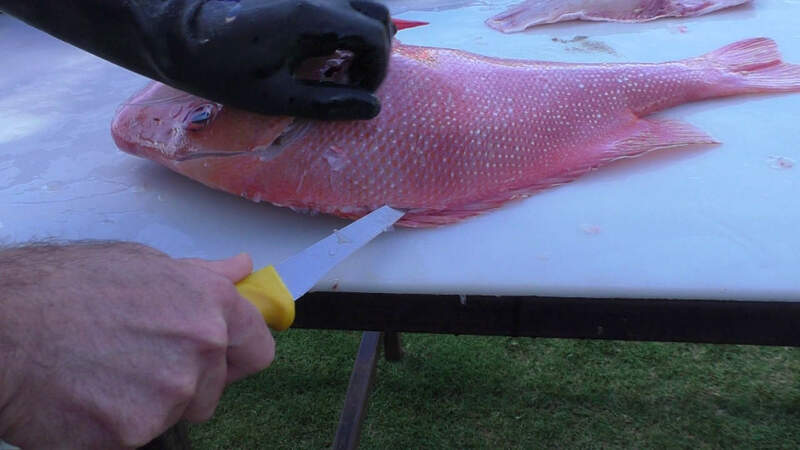 Place the knife back in at the tail of the fish as shown. 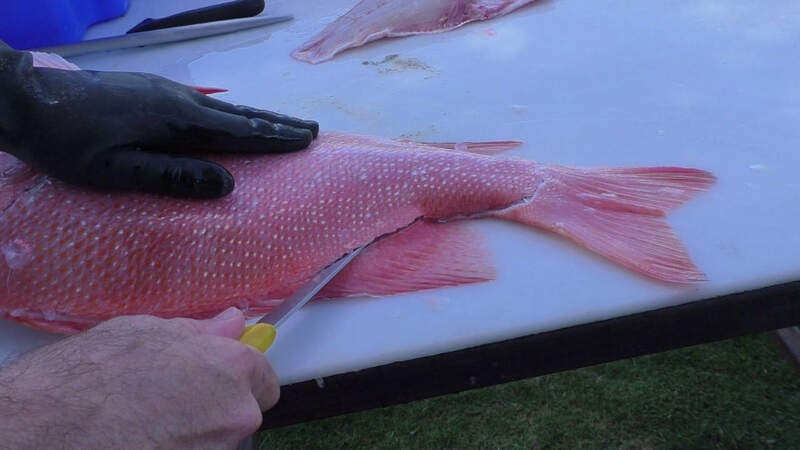 Ensure the knife is pressed well into the cut and your left hand is on top of the fish and well out of the way. With long swiping motions cut up towards the head clearing the flesh off the bones right down to the spine. You need to keep the knife pressed down on the bones with just enough angle to allow the knife to slide smoothly without getting caught. Again the curve of the spine makes this step a bit tricky so take your time if you are inexperienced. 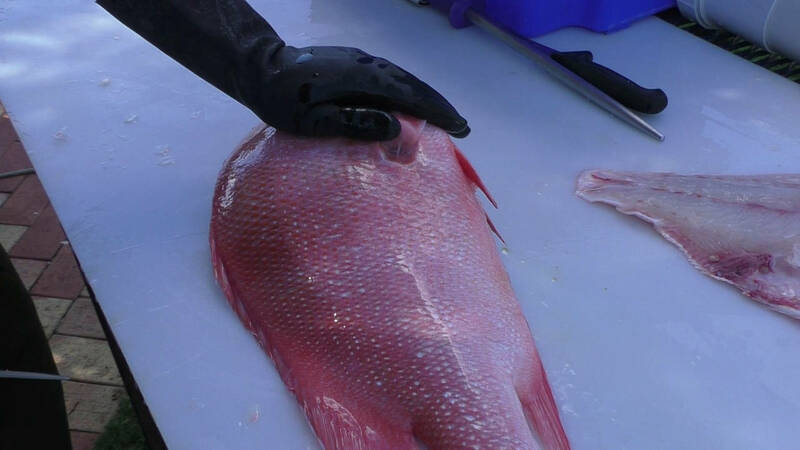 Finish right up in the head, remember to follow the curve of the spine which will get steeper as you approach the head of the fish. Lift the fillet up to check the flesh has all been cleared away cleanly as shown. 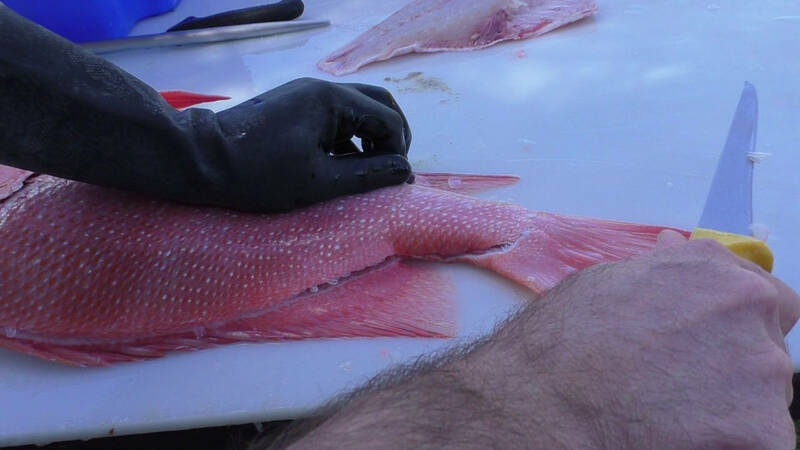 Go to page 4 of the filleting tutorial. 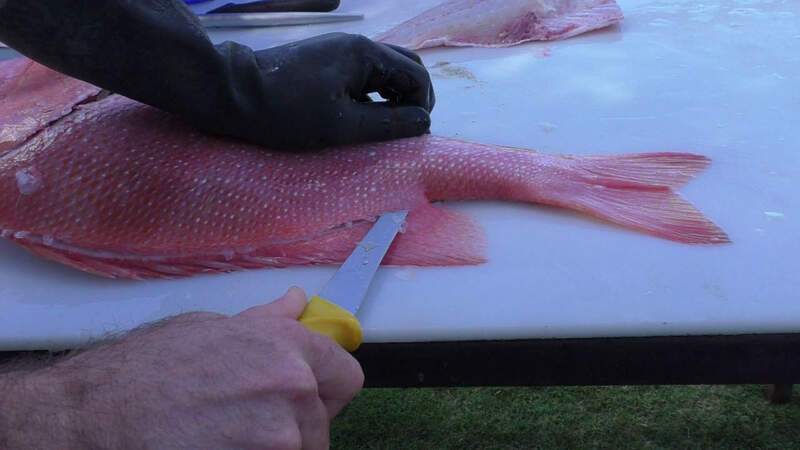 Watch dozens of free video lessons on how to fillet a fish.